Rescroft Ltd, the UK transport and specialist automotive seating company has acquired the designs, IPR, tooling and certain material stock of People Seating Ltd (PSL) the UK train, light rail and tram seat manufacturer. David Poston, former Managing Director of PSL will be retained by Rescroft as a consultant. This strategic acquisition will strengthen Rescroft Ltd as the leading UK designer and manufacture of public transport and specialist automotive seating solutions. It is the intention of Rescroft to continue supplying the existing rail seats and trims as supplied by People Seating and develop a new range of train seats. 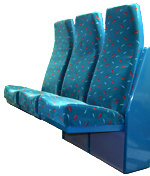 Rescroft Ltd was formed in 1976 and has established itself as a major UK designer and manufacturer of bus, mini bus, accessible and specialist vehicle, commercial vehicle and sports car seating systems. Rescroft Ltd supplies the UK and international markets. Rescroft Ltd, an ISO9001/2008 accredited company designs and manufacture seating solutions from complete seat frames, foam moulding and trims in leather, PVC and fabrics.